I met Michael through mutual friends while I was visiting New York. I was living in Chicago at the time. I work in financial marketing and also own and operate LVK Jewelry, and Michael works in finance. I had a feeling when I first met him that he might be the guy I would end up marrying and we stayed in touch. After some long distance dating, I decided to move to New York to be with him. Over the next six years of dating, Michael and I would take an annual trip to Lambertville in NJ. We hiked Goat Hill Overlook and when we reached the top with its beautiful view, Michael got down on one knee and asked me to marry him! Since Michael’s family is from New Jersey and mine is from Illinois, it was hard to find a location that would work for everyone. 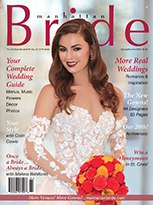 We decided to search for a local NY or NJ venue because we wanted the chance to meet our future vendors in person. We went to several venues but were never fully satisfied until we stumbled upon Waterside. 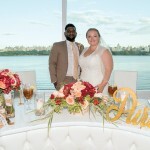 I scheduled a site visit with Shantal Videla, wedding coordinator, and we were in awe of the venue’s breathtaking view and the décor. It was close enough to the city for our out-of-town guests and easy for Michael’s NJ family to get to. In addition to its out-of-this-world view, the food was amazing. 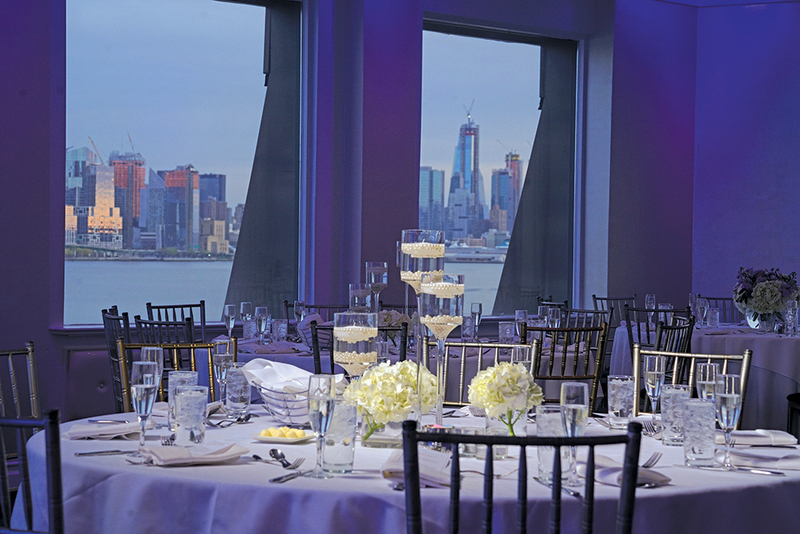 I could already envision our outdoor wedding, literally being “Waterside” with that NYC backdrop. We relied heavily on Shantal’s vendor recommendations which made everything so easy. On the day of, Shantal and Miguel, the mâitre d’, attended to our every need. We had a catered lunch at the hotel as my bridal party and I got ready. My hubby-to-be even sent me a special flower delivery! We had an extremely emotional first look and our guests arrived at the venue that evening for the ceremony. 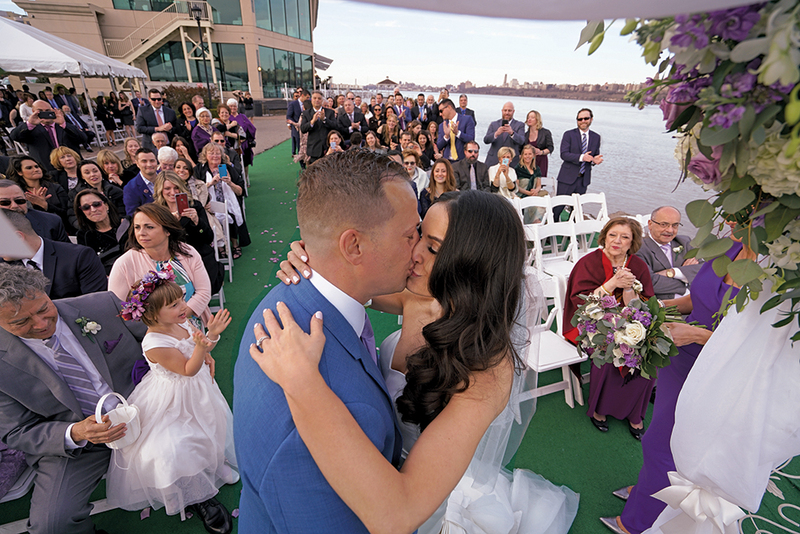 We were married by one of Michael’s close childhood friends, Gary Novello, who happens to be a deacon, while overlooking the beautiful NYC sunset wedding we wanted. 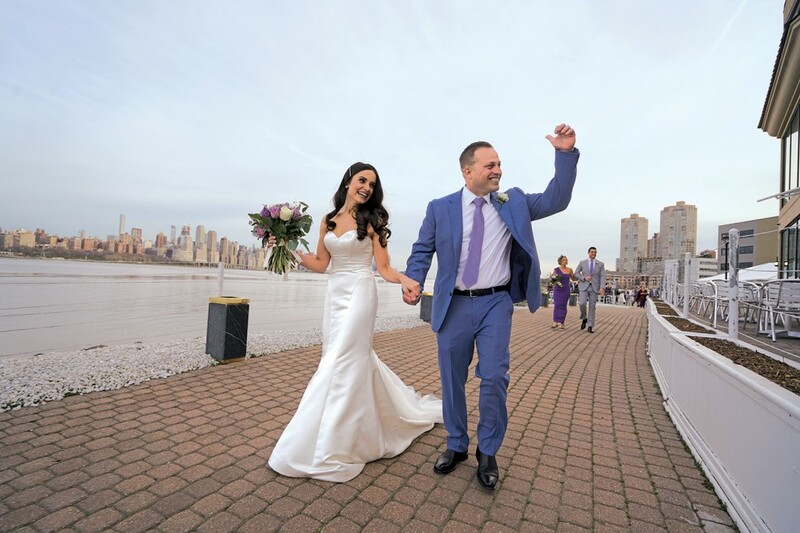 After the ceremony, guests were escorted to the second floor for the cocktail hour while Michael and I posed for photos around the venue’s picturesque locations. 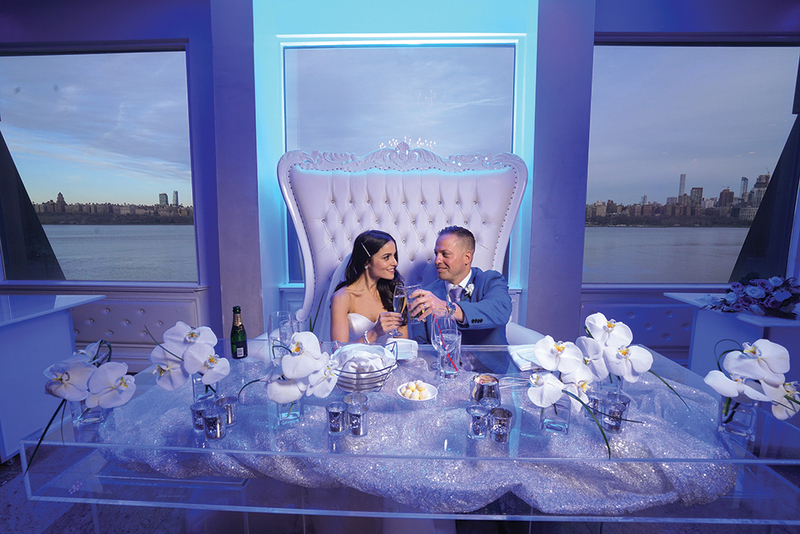 According to their feedback, our guests got to experience one of most amazing cocktail hours ever, accompanied by a magical view of the sunset over the Manhattan skyline. Cocktail hour was filled with all sorts of food, including a pasta station with classics such as lasagna and rigatoni and a carving station serving fresh pork and beef. Shantal and Miguel kindly set up food for us from the cocktail hour so we could enjoy a bite before arriving at the end of the hour. Our reception was held on the third floor in the main dining room. The dance floor was in the center of the room and our sweetheart table at the end. For dinner, we started with a first course of fresh mozzarella with vine ripe tomatoes, roasted peppers, and fresh basil over mixed organic greens with champagne vinaigrette. For the main course, guests had a choice of rib eye with a béarnaise sauce, roasted cornish hen with balsamic glaze, or Chilean sea bass with lemon thyme butter sauce. All were served with garlic mashed potatoes and grilled asparagus and everything was delicious. Our guests danced the whole night thanks to our amazing DJ, until we had our “Big Surprise” reveal at the end. 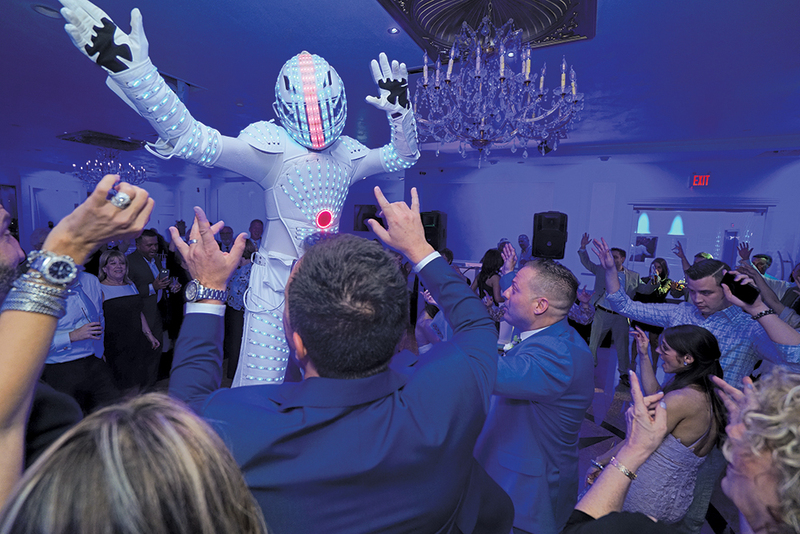 A huge dancing robot, booked through our DJ, stormed into the room and the last hour was spent with guests taking selfies and dancing with the robot! Thank you to all our vendors and to Shantal, Miguel, and the amazing staff at Waterside for taking such excellent care of us. We are so fortunate and forever grateful for all the support and love we received from our vendors, family, and friends.